Real Madrid have got a world-class squad, and so it comes as no surprise that they’re pulling off tricks and flicks in training sessions all the time. 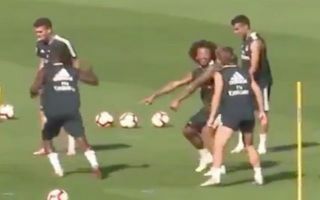 It looks like the players were enjoying themselves in training on Friday, as seen in the video below with Luka Modric deciding it was the right time to drop a nutmeg on youngster Vinicius. While the rest of the squad didn’t seem to care too much for it, Marcelo was on hand to make sure that his compatriot didn’t get away with it as he lets off an hilarious shriek while enjoying the moment with Modric after he pulled off the lovely bit of skill. Being Brazilian and given the flair that they possess and the enjoyment they get out of entertaining while playing, it’s no surprise that Marcelo didn’t let the nutmeg slide. As seen in the video below, the defensive stalwart is no stranger to enjoying his own tricks in training either as for a left-back, he has some amazing control and creative quality.